Carolina Home Exteriors licensed home remodel contractors are more than just builders. It’s important that every project not only exceeds functionality goals, but also must match the home’s style adding to the overall value and beauty. This becomes most apparent in roof styles and overall sunroom and enclosure design. A patio enclosure can be built directly under an existing roofline, but in new Sunroom construction special care must me made to match the aesthetic of the home’s roof style. Pitched roof (or gable) styles, dormers, gambrel, mansard, shed, gazebo, saltbox, hip and other custom roof designs are all considered when designing your custom build. Countless satisfied customers are proud to show off their Carolina Home Exteriors projects, and feel safe and secure sitting beneath roofs of many styles, knowing that licensed contractors and expert designers have matched their needs with proven design concepts and exceeded accepted building practices and required codes. Don’t trust your project to anyone who’s not licensed. How will the sunroom hold up to harsh weather and elements? 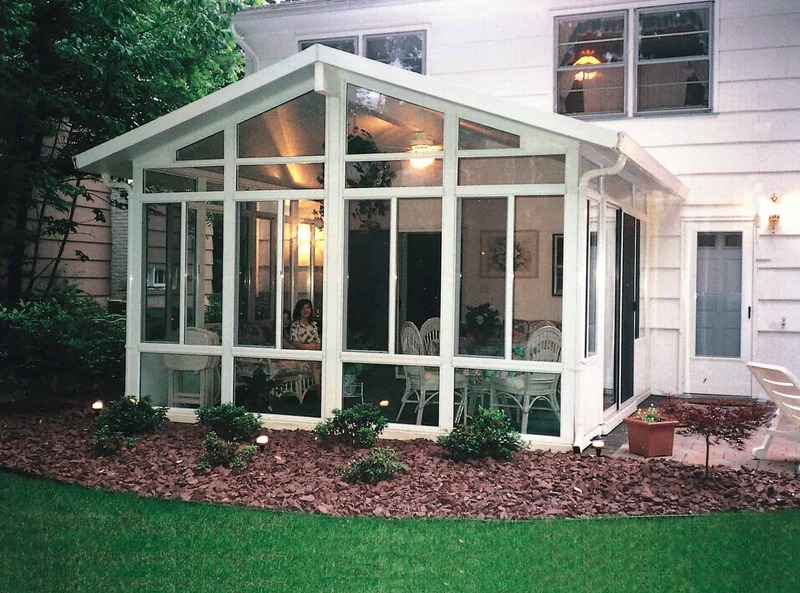 Each of our sunrooms is designed to International Residential Code (IRC) standards. We have designs to withstand exterior conditions including high winds. Engineering specifications are available for exact requirements. Vinyl is a great insulator and does not deteriorate under most weather conditions. What is the Maintenance for my Sunroom? Our Sunrooms are designed to be easily maintained. Glass can be cleaned with household glass cleaner. Vinyl windows can be cleaned with a mixture of warm water and Wool-Light or Murphy Oil Soap. Screens pop out for easy cleaning also. The structure may need a periodic cleansing with a mild household detergent and water solution to remove and build-up. If an accident occurs that damages the room in any way there are many simple ways to repair and touch up the damaged section. Repairs are handled quickly and easily. Click here for detailed Eze-Breeze Window Care and Cleaning Instructions. Does my project come with a warranty? Our sunrooms and other project materials come with a Limited Lifetime Warranty against manufacturer's defects. In addition, Carolina Home Exteriors offers a 1- year warranty on our workmanship. Along with our suppliers, we stand behind our products, and we stand behind our trained, professional installers, and their workmanship.